The track record of man-made enzyme mimetics is not impressive. I previously commented that, time and again, we get beaten by nature’s enzymes in terms of catalytic efficiency. If we consider hydrolases, it is all about the spatiotemporal relationship between their catalytic amino acid residues and the peptide bond that is being cleaved. Things happen at the right place and at the right time. There have been many attempts to prepare synthetic hydrolase mimetics that were claimed to be close to their natural congeners in terms of catalytic efficiency. None of these examples have withstood the test of time: each was shown to be the product of sample contamination with some hydrolase. However, there is one really excellent example from the past that employs spatiotemporal arguments and proves that, once proximity has been secured, amazing efficiency for activating strong bonds can be achieved. A classic JACS paper by Fred Menger from 1988 describes a very curious amide that hydrolyzes fast at neutral pH with a t1/2 of 8 minutes, which corresponds to an effective molarity of at least 10l2M. 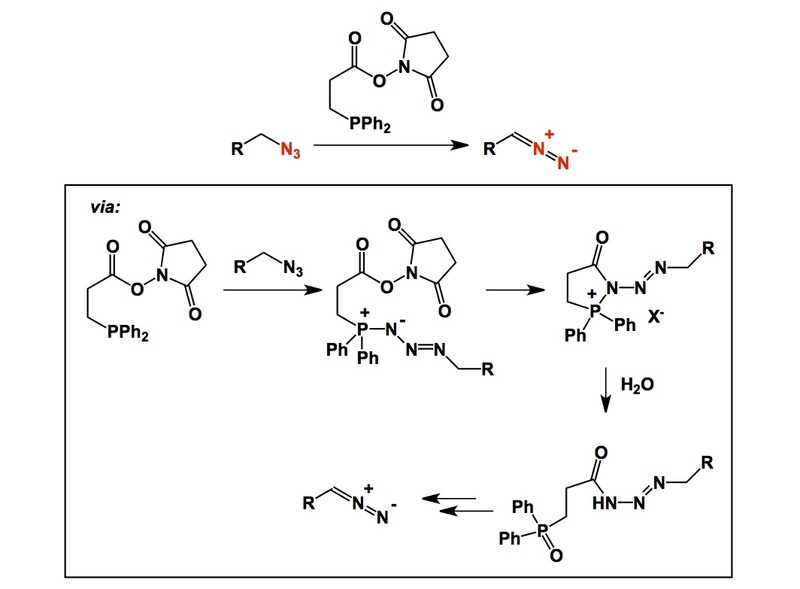 Given the strength of the prolyl amide linkage, this classic example is remarkable. Is there an immediate use for something like this? It is difficult to think of an application, but there is a lesson here to those of us who are driven by small peptides that fold into compact shapes. First and foremost, I refer to cyclic peptides and peptidomimetics. The question about cyclic peptide stability has been raised time and again, yet one often assumes that it is all about stability against proteolysis. The proteolytic degradation is difficult for a cyclic peptide (to the extent that it is not even worth pointing out this feature as a cool attribute of cyclic peptides – it is obvious that they do not adopt the necessary extended conformations. Here is a great reference that discusses this property, by the way: http://pubs.acs.org/doi/pdf/10.1021/cr040669e). But chemical stability is another issue and I would predict that there are cases where amide bonds in complex macrocycles are unstable for reasons that operate in the case described by Menger 25 years ago. People often equate the presence of fluorine in organic compounds with increased stability and other unique properties. The trifluoromethyl group is sometimes erroneously equated with some “magical” stabilization. Honestly, I think we tend recall Teflon way too much. Tonight I want to talk about two fluorinated groups: one is well-known (CF3), while the other one is rather obscure (SF5). 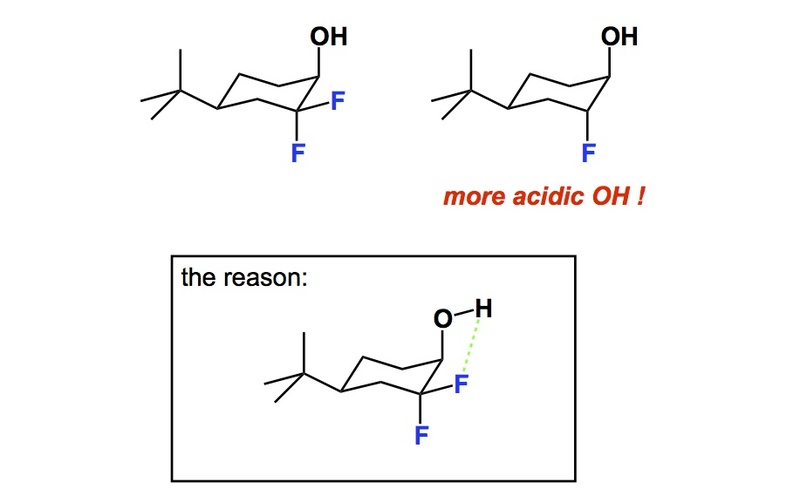 The reality is that the trifluoromethyl (CF3) substituent is not that stable (I did my whole PhD on it…). For instance, in some cases, you can quantitatively hydrolyze it under aqueous alkaline conditions into the corresponding carboxylate. But this is only part of today’s story. In terms of stability, I want to point to a lesser-known group – pentafluorosulfanyl (SF5) – which is poised to become a very interesting moiety with which to design materials and pharmaceuticals. At first glance, this thing just does not look right as there seem to be way too many fluorine atoms. But it is what it is: sulfur in the oxidation state “+6”. 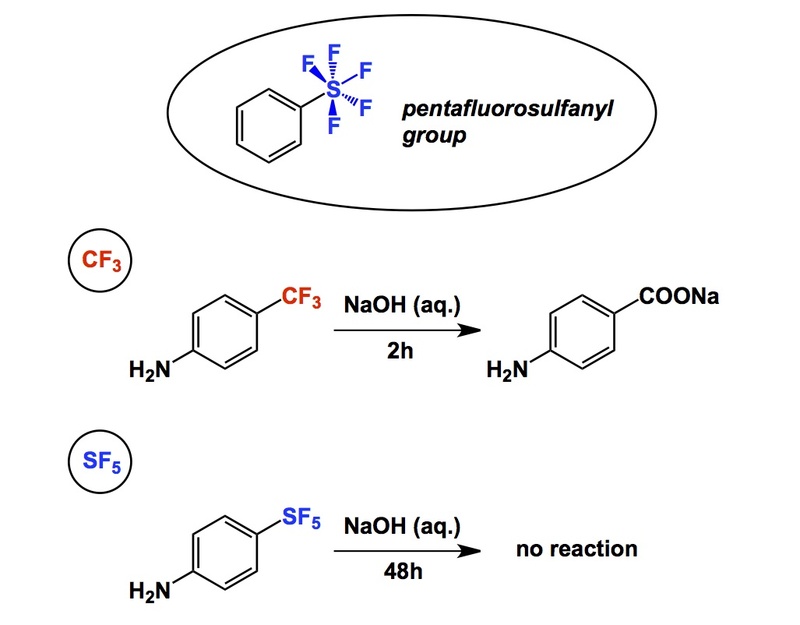 The hydrolytic stability of SF5-containing molecules makes trifluoromethylated analogs pale in comparison. Take a look at the reactions shown below! In addition, the van der Waals volume occupied by the SF5 group is slightly larger than that of the CF3 substituent. The SF5 group is also more lipophilic. This property, along with improved stability, ought to make SF5–containing compounds more and more interesting in drug design. In fact, there are examples of biologically active molecules that derive their properties from the unique characteristics of the SF5 substituent. There will be more on that in my future posts. What’s going on with Bro5? In terms of basic science, control over cis– vs trans- amide bond geometry is one of the ongoing research areas pursued by my lab. We think that this problem is important for many reasons that range from fundamental physical organic chemistry to one’s ability to dictate conformations in complex polyamide macrocycles. I have already blogged about some elements of amide cis / trans interconversion. Recently, my lab has uncovered an interesting case that points to the possibility of kinetic selection between these rotamers. On the heels of our findings, I started to think about the smallest possible ring where a clear-cut cis/trans interconversion can be observed. Below is an old and very thought-provoking paper by North and Zagotto. Apparently, amide geometry in the 8-membered ring that you see is determined by the relative configuration of the two chiral centers. Strikingly, the two cyclic diastereoisomers have different preferences for the amide bond geometry. It is highly unlikely that the cis-amide (case B) is present in the starting linear dithiol before oxidative cyclization. What likely happens in the case B is a thermodynamically controlled cyclization that involves product isomerization into a more stable (NB: in this particular instance!) cis-amide. 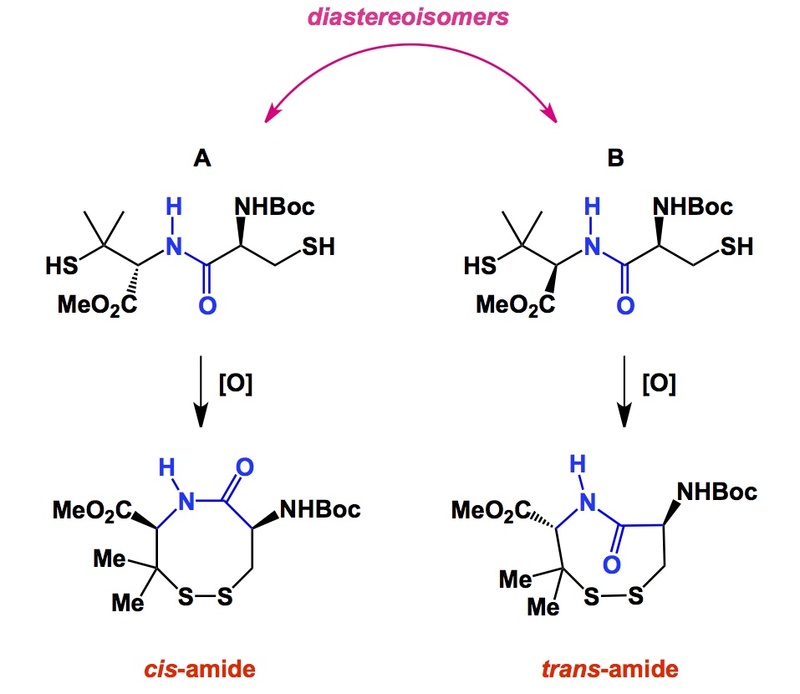 I will leave it up to you to wonder why the cis-amide is preferred in the cyclic diastereoisomer corresponding to B. I do think that disulfide’s flexibility might be playing a role in allowing the final isomerization to take place. To my knowledge, the 8-membered ring shown below is the smallest cycle that shows such interesting cis/trans amide behavior. If you now of a smaller system, please let me know. As I prepare my lectures for the second year organic chemistry class, I can’t help but wonder about a good way of teaching Lewis acid/base chemistry. When our students learn about the likes of AlBr3 for the first time, they get used to the idea that Lewis acids are, by their very nature, water-sensitive compounds. There is no doubt that the vast majority of “traditional” Lewis acids do not respond well even to trace amounts of water. In fact, the notion of water-tolerant Lewis acids would have been a heresy even 20 years ago. But things have changed. When I talk about the “next-gen” Lewis acids, I always point to the classic work of Kobayashi, particularly to his insightful JACS paper from 1998. In it, Kobayashi has taught us all a valuable lesson in achieving the balance of thermodynamic and kinetic factors in regards to Lewis acidity. If the key parameters (the so-called water exchange rate constant (WERC) and hydrolysis constant) are chosen properly, a metal-based salt could turn into an excellent Lewis acid even in the presence of water. What takes place between a given metal salt and water is substitution of inner-sphere water ligands. To have a Lewis acid catalyst in water, all you need to do is tone down your metal’s affinity to water, while keeping water exchange rate constant high. If the stars are aligned properly, the resulting compound will have a chance to be a water-tolerant Lewis acid. It makes perfect sense: in an aqueous environment, metal salts would undergo exchange reactions of their water ligands. If the substrate you want to activate exists in the system, it can coordinate to the metal cation instead of the water molecule, resulting in Lewis acid activation. Rational, parameter-driven choice of reagents is relatively rare in synthesis, which makes this classic Kobayashi’s paper particularly important.